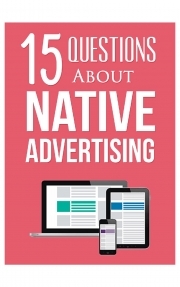 Description of "15 Questions About Native Advertising (eBook)"
2. Is It a New Practice? 3. Is Native Advertising Legal? 4. Are Content Marketing and Native Advertising the Same? 5. What Happened to Social Media Marketing? 6. What Is Social Media Marketing Today? 7. What About Influencer Marketing? 8. Does Native Advertising Happen Only on Social Media? 9. What About Native Advertising on Newspapers? 10. Can It Get Any Worse? 11. Does Native Advertising Work? 12. Why Does It Work? 13. Does It Have Negative Consequences? 14. Should Native Advertisement Be Deregulated? 15. What Does the Future Hold for Native Advertising? Starting in 2000, I have worked or consulted for a number of start-ups from more countries than I can probably remember: Germany (Ciao); France (Meetic); Italy (Ennunci); Sweden (Twingly); Italy/Ireland (Zzub); Denmark (Atosho); Spain (Ducksboard); and now Canada (Transit App). Reviews of "15 Questions About Native Advertising (eBook)"